There are markets and then there are…. 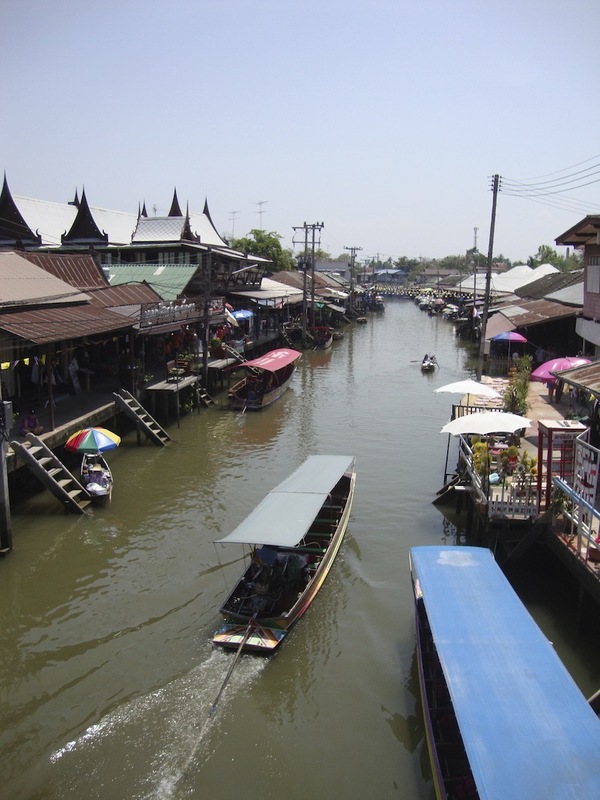 floating markets and train markets. 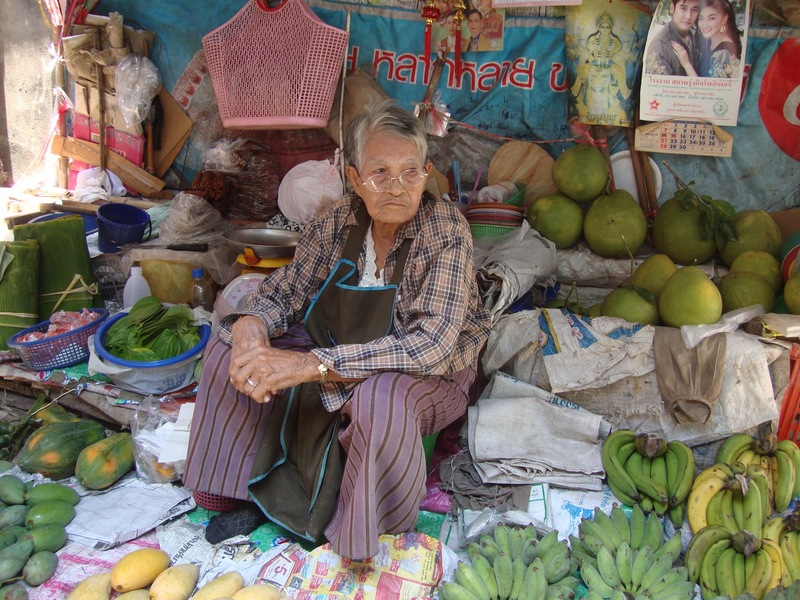 On our recent visit to Thailand we made an trip to Damneon Saduak and Mae Klong, about an 90 minutes drive outside of the capital, Bangkok, in the Ratchaburi and Samut Songkhram regions, to visit these two very unique daily markets. 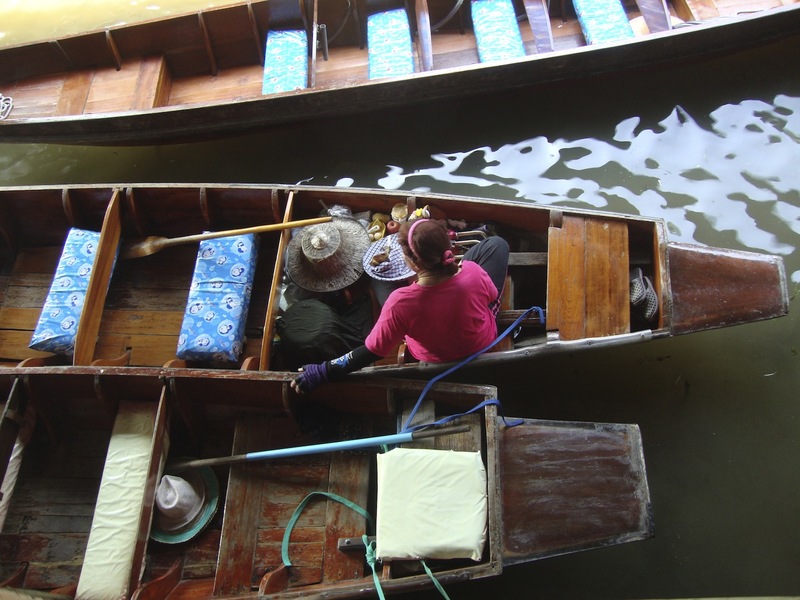 It was a Sunday morning and a normal trading day and we began by having breakfast alongside the river before boarding a long-tailed boat to reach the nearby floating market. 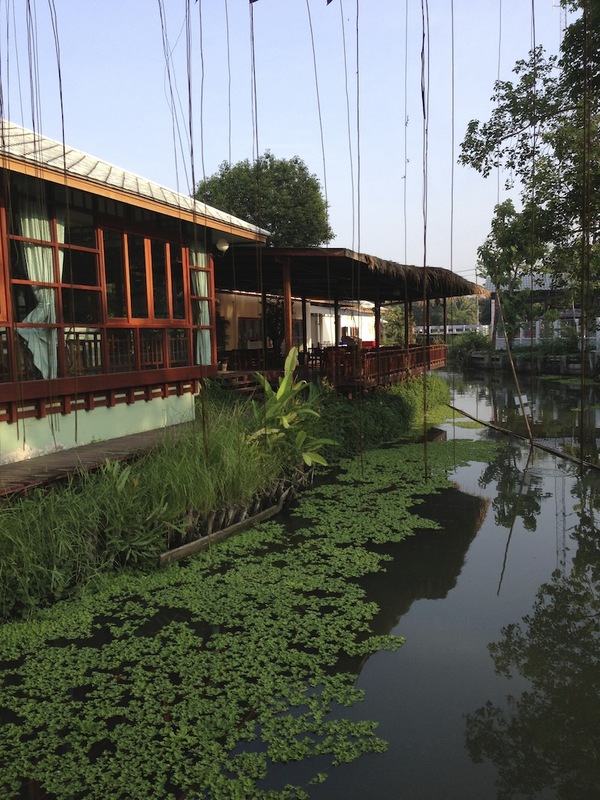 As we travelled along the canals, it was easy to see that in this community life revolved around the water, both banks were packed with homes and businesses which could be accessed primarily from the water. 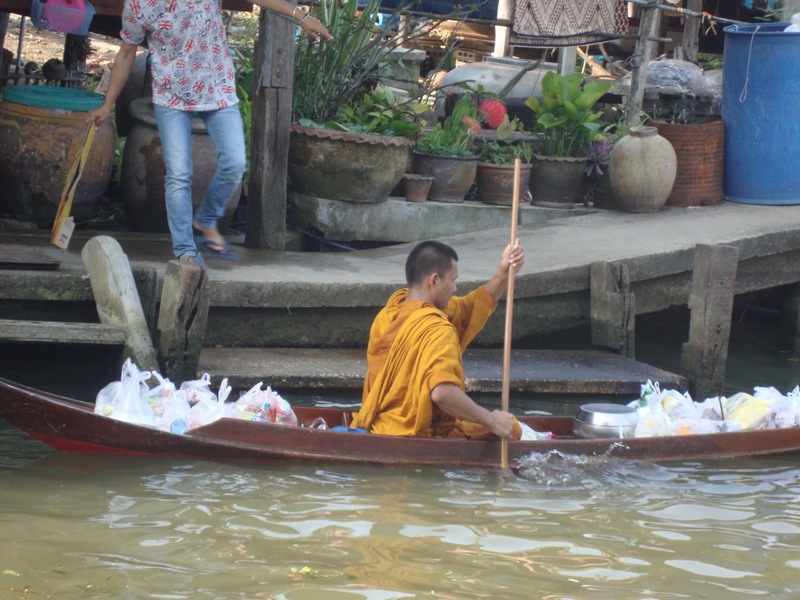 Children played and swam in the water like it was their own private pool or front yard, we saw a monk make his way from ‘door to door’ to collect alms and even the mail is delivered by boat. 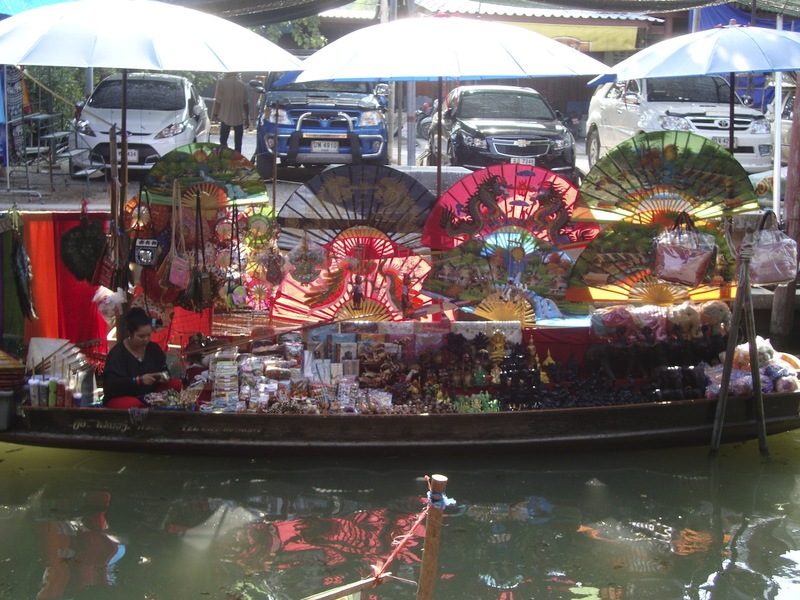 Having previously seen pictures of Thai floating markets I knew to expect noise, colour, hustle and bustle, and crowds of people and when we reach the market we weren’t to be disappointed. Wherever we looked there was a myriad of colour, the clamber and noise of deals been struck, cameos of vendors and customers, a slice of life so to speak. It appeared to be chaos, at least from the outside looking in and yet there was order in this chaos. 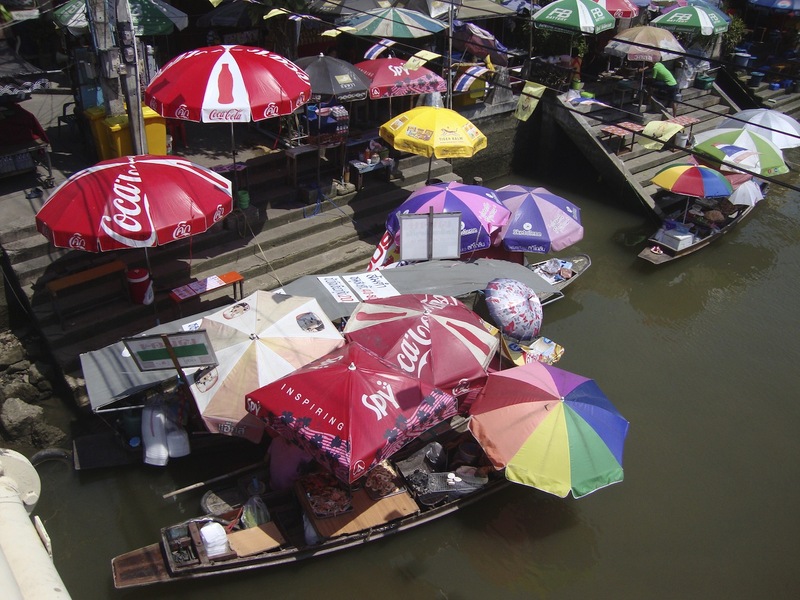 Those vendors who spoke english busily sold food and souvenirs to tourists from their quayside boats, while those selling produce made their way up and down the river to supply locals in boats and vendors alike. In turn those customers who had ordered food sat on low stools or steps at makeshift tables all along the bank and waited while food was passed up to them from nearby ‘boat kitchens’. Then they ate while chatting or people watching, like it was the most normal thing in the world. On the other hand, with the train market, I had no idea what to expect. There was the mention of the train timetable and so we thought the train market must be arriving from somewhere. However we were completely off the mark. 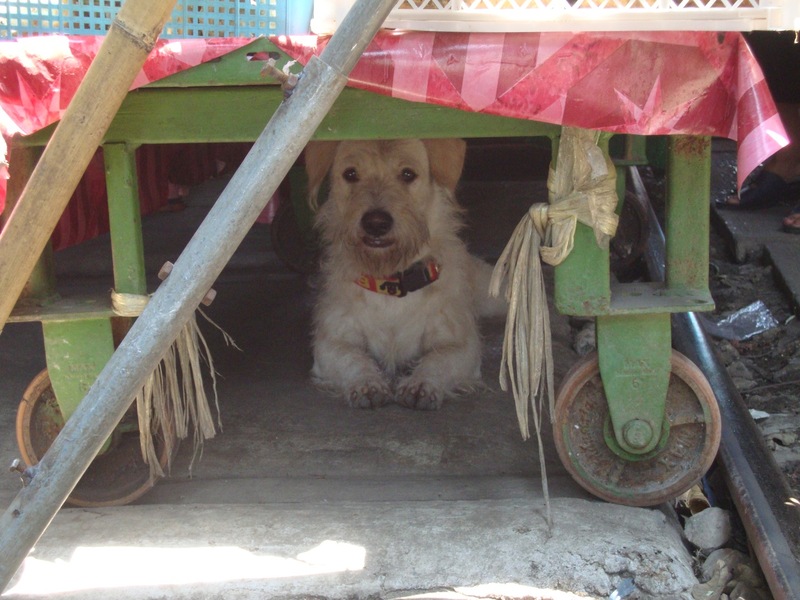 When we reached the market, from the exterior and even as we made our way through the narrow passages, it looked pretty much like any of the many markets we had already seen on our travels. Stalls with colourful and exotic fruits and vegetables, prepared foods, meat on butchers blocks and fish in buckets or tanks. We wound our way through the crowds and stalls and just as I began to wondered again where the market had gotten it’s name from, we were rushed forward to what appeared to be a small clearing, at the edge of the market just in time to see the noise and business of the day grind to a halt and be replaced by the whistle and rumble of a train as it drove straight through the centre of everything with only inches to spare on either side. 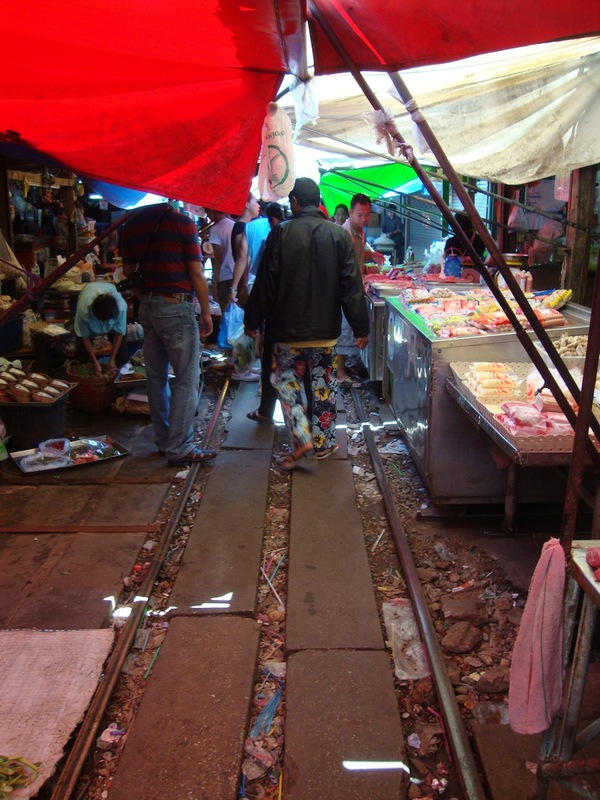 Once the train had passed the vendors pulled out their retractable awnings and pushed their stalls back onto the tracks again and market activity proceeded as normal. 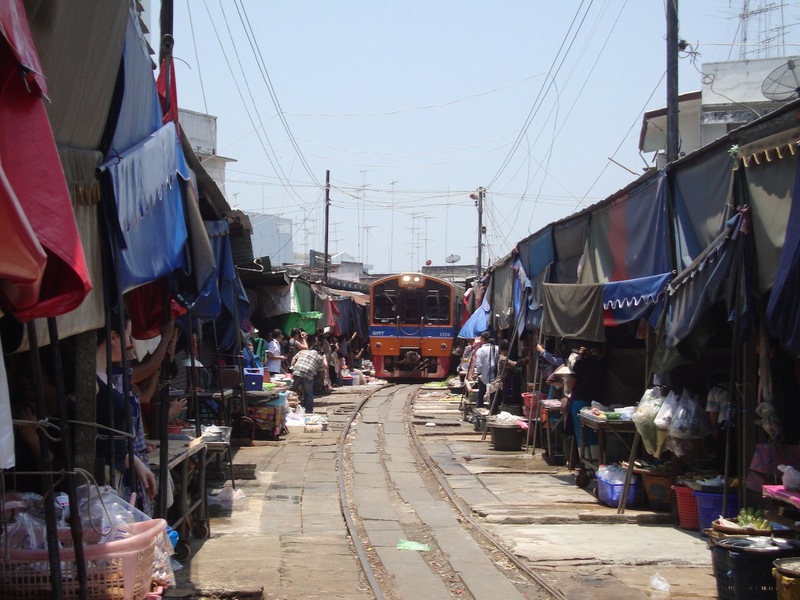 This procedure is repeated time and again throughout the day as trains arrive and depart the nearby Mae Klong station. It is a interesting rhythm and one of the most bizarre scenes I have ever witnessed. Click here to see video footage.